Of late, there have been some efforts by various research groups to predict the monsoon and topical weather on extended range time scale. The extended range forecasting (forecasts between 7 and 30 days) fills the gap between medium-range weather forecasting and seasonal forecasting. It is often considered a difficult time range for weather forecasting, since the time scale is sufficiently long so that much of the memory of the atmospheric initial conditions is lost, and it is probably too short so that the variability of the ocean is not large enough, which makes it difficult to beat persistence. Since the Madden Julian Oscillation (MJO) is the most important mode of tropical intraseasonal variability with potentially important influences on the monsoon activity in the Asian regions, the capability of statistical or numerical models in capturing MJO signal is very crucial in capturing the active/break cycle of monsoon. Recently, with the efforts from the Ministry of Earth Sciences (MoES), operational implementation of coupled model with a suite of models from CFSv2 coupled model has been implemented in IMD during July 2016. This dynamical prediction system developed at IITM has been transferred to IMD and the same has been implemented by IMD for generating operational Extended Range Forecast products to different users. This suite of models at different resolutions with atmospheric and oceanic Initial conditions obtained from NCMRWF and INCOIS assimilation system respectively are (i) CFSv2 at T382 (. 38 km) (ii) CFSv2 at T126 (. 100 km) (iii) GFSbc (bias corrected SST from CFSv2) at T382 and (iv) GFSbc at T126. The operational suite is ported in ADITYA HPCS at IITM Pune for day-to-day operational run. The Multi-model ensemble (MME) out of the above 4 suite of models are run operationally for 32 days based on every Wednesday initial condition with 4 ensemble members (one control and 3 perturbed) each for CFSv2T382, CFSv2T126, GFSbcT382 and GFSbcT126. The same suites of model are also run on hindcast mode for 13 years (2003-2015). The average ensemble forecast anomaly of all the 4 set of model runs of 4 members each is calculated by subtracting corresponding 13-years model hindcast climatology. For the preparation of mean and anomaly forecast on every Thursday, which is valid for 4 weeks for days 3- 9 (week1; Friday to Thursday), days 10-16 (week2; Friday to Thursday), days 17-23 (week3; Friday to Thursday) and days 24-30 (week4; Friday to Thursday). .
Week 1 to week 2: Northwesterly wind over northwest India bringing cold air. Trough of low over southern parts of Bay. Week 3 to week 4: No significant system during the period. Week 1 and 2 : Main rainfall part is over southern peninsula and Bay island during week 1 and week 2. 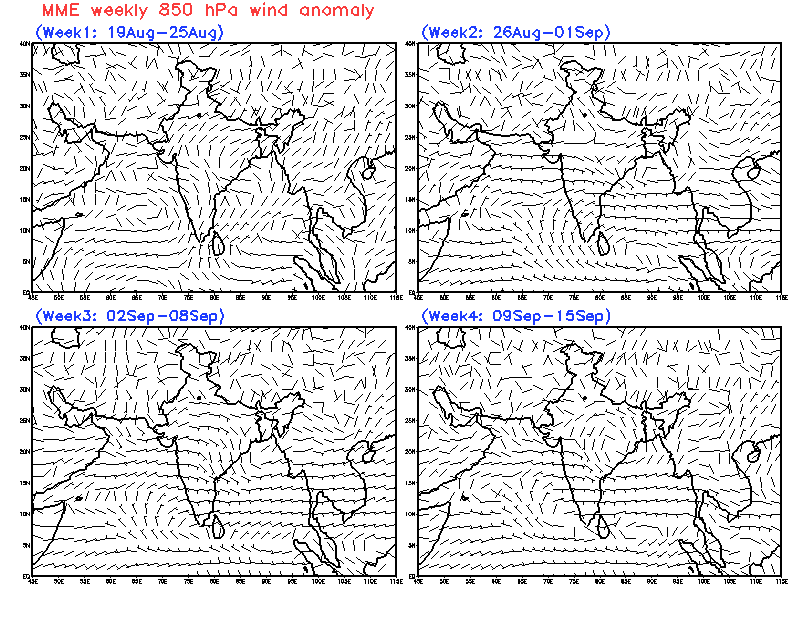 Week 3 & 4: Over extreme northern most part of India some precipitation likely during the period. Some parts of Bay island may also get some rainfall. Week 1 and 2: Mostly below normal Tmax over the country. 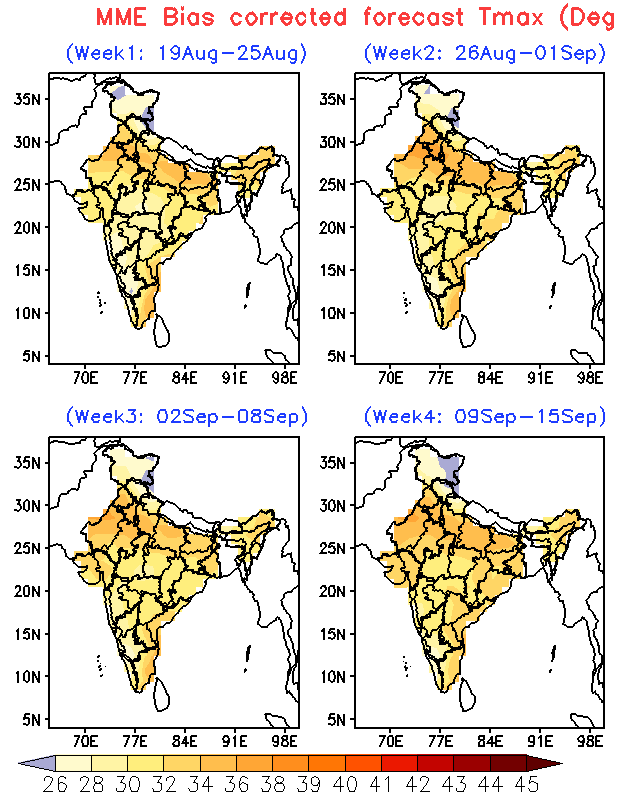 Week 3: Over some parts of extreme north India, parts of NW India and NE India Tmax will likely to increase with most of remaining parts of India it will be below normal Tmax like the previous weeks. 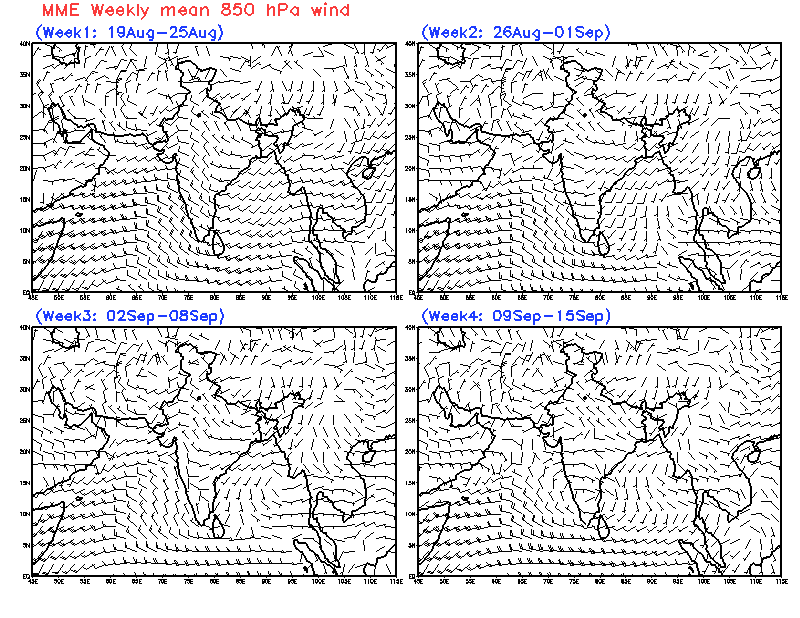 Week 4: Except parts of southern peninsula and adjoining central India Tmax will be above normal over India. Week 1 to week 2 : Northern parts of the country will be under the influence of cold wave with Tmin < 5 C over many parts of north India. Tmin is expected to be below normal over most of India. 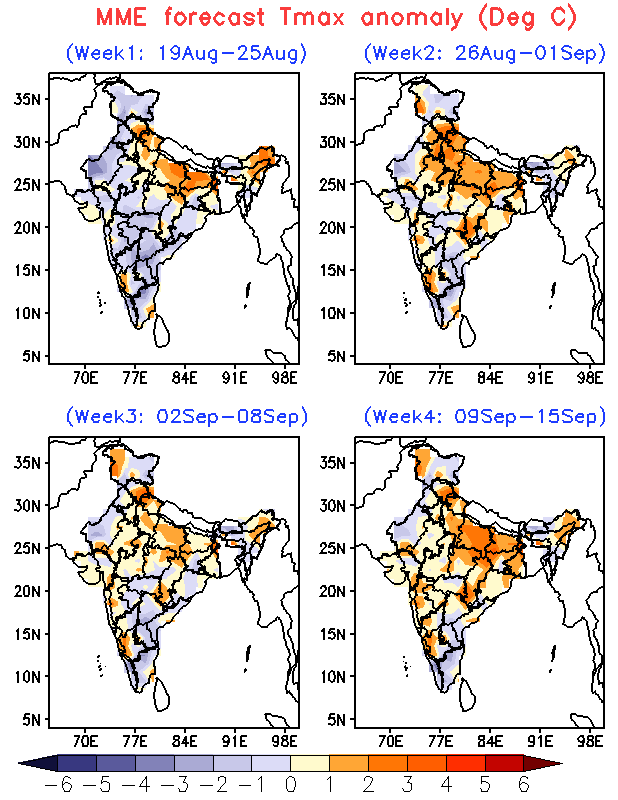 Week 3 : Tmin is expected to be below normal over most of India except some parts of extreme north India, NE India and isolated region over western India. 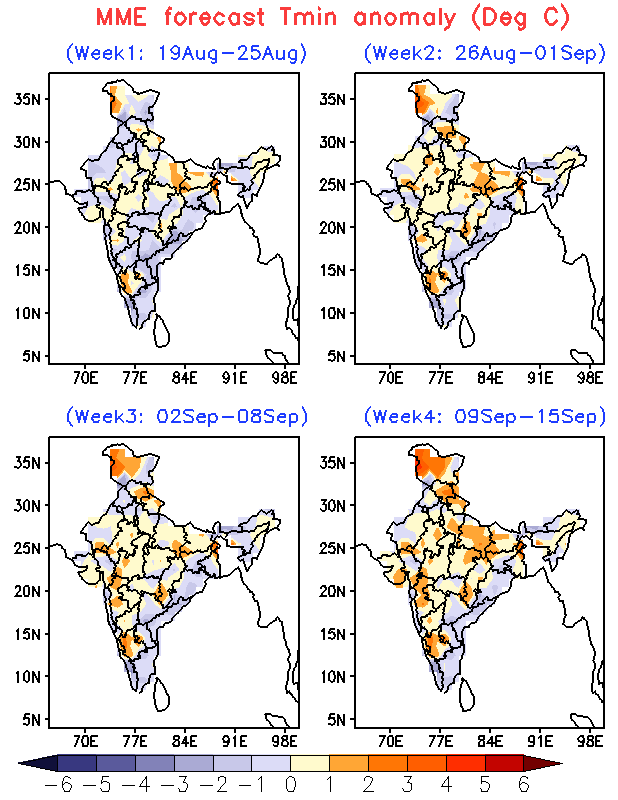 Week 4 : Below normal Tmin regions will migrate to eastern belt of the country thereby southern peninsula and adjoining central and parts of India will have below normal Tmin. 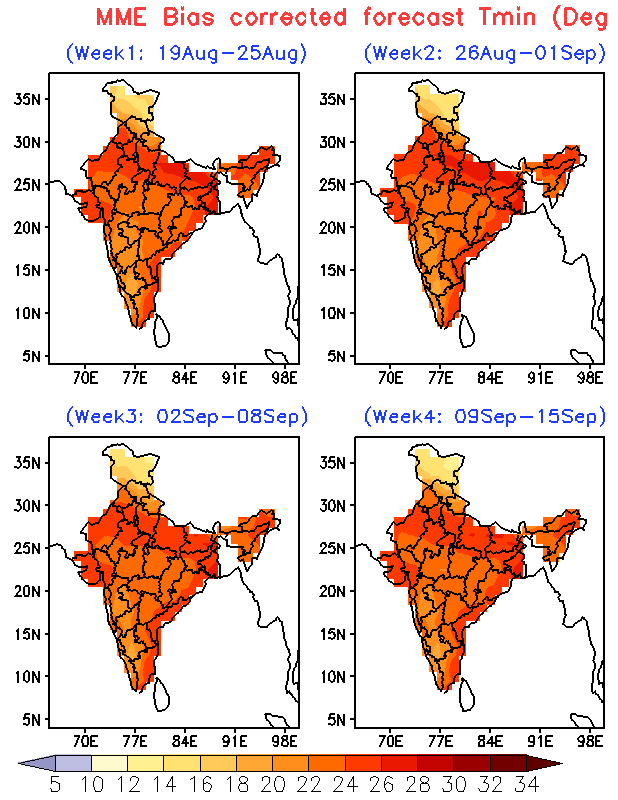 NW India, North India and NE India Tmin will be above normal.